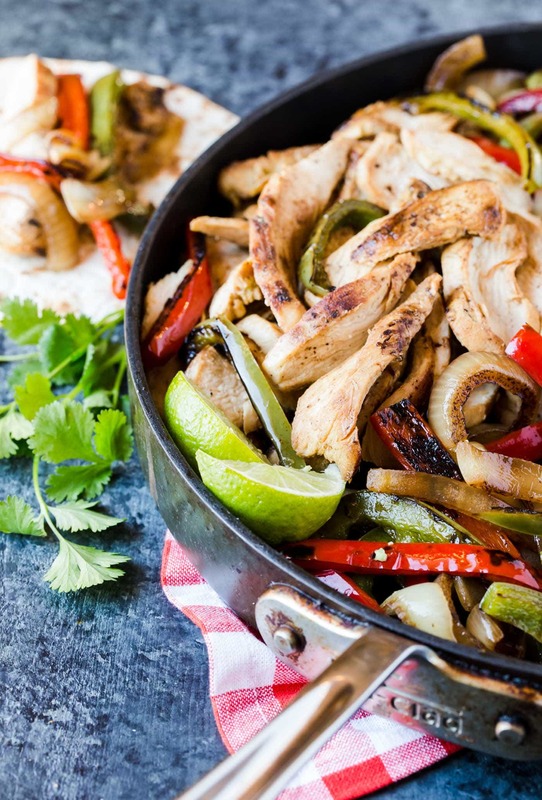 Nothing says fiesta like this recipe for fresh, flavorful Tequila Lime Chicken Fajitas! Fajitas are always a crowd-pleaser, but this simple and flavorful recipe for Tequila Lime Chicken Fajitas is one of my favorites. Why? Because the marinade does all the heavy lifting the day before, seasoning and tenderizing the chicken. A quick spin on the stovetop is all that’s left to do when it’s time to eat. How easy is this marinade? Basically all you need to do is dump a handful of flavorful ingredients in the blender (think fresh cilantro, tart lime juice, spicy jalapeño and, of course, tequila), blend until smooth and pour over the sliced chicken. The chicken can bathe in the tequila lime marinade all day long soaking up all the spices and flavors. Make-Ahead Tip: Slice your veggies the day before and store them in the fridge until you’re ready to cook the fajitas. That little bit of prep work helps the meal come together quickly – a huge help when entertaining. You can either grill the chicken and veggies in a grill pan or sauté them on the stovetop, if you prefer. (I like to cook my chicken and vegetables separately so my veggies stay crisp-tender, but that’s just me.) 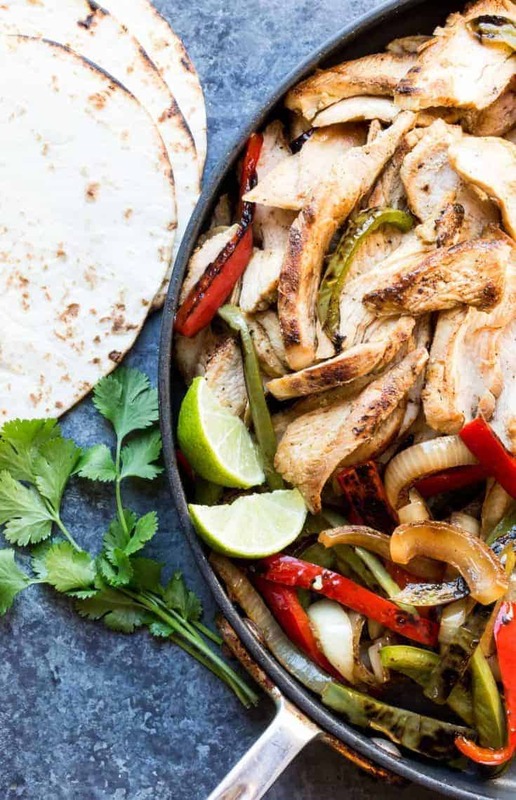 All that remains before diving into these Tequila Lime Chicken Fajitas is to warm the tortillas and assemble a few different fajita toppings, like sour cream, lime wedges and avocado. Of course, no fajita fest is complete without a glass of these golden margaritas or pitcher of these raspberry palomas. Plus don’t forget the chips and guacamole! Combine all marinade ingredients in a blender and mix until throughly combined. Add chicken to a large ziploc bag and pour marinade over chicken. Refrigerate for at least 8 hours. Remove chicken from Ziploc bag and discard remaining marinade. Toss bell peppers and onion with a small amount of canola oil. Add your desired amount of salt and pepper. Cook chicken until no longer pink. Remove from pan and keep warm. Cook peppers and onions until they are crisp-tender. Warm tortillas according to package directions. Serve with optional sour cream, lime wedges, avocado slices or guacamole. All fajitas should be made with tequila! Olay! Couldn’t agree more. Thanks, ladies! What a lovely and simple way to make fajitas. I’ve got a bottle of tequila sitting in my liquor cabinet and a couple of frozen chicken breasts – this could be happening soon! These fajitas look so colorful and yummy, and this is coming from a Texas girl! 🙂 Beautiful food photography too! These look amazing! I love chicken fajitas but adding lime will give them that extra something special. Thanks for a great recipe! The lime just adds a bit of freshness to it, Mary. Enjoy! Love your presentation, love the photos, love Tequila 🙂 Thank you so much for this recipe !